Please read our customers testimonials below to give you an idea of the commitment we have to our customers and our quality workmanship in traditional brickwork, pointing and re-pointing craftmanship. 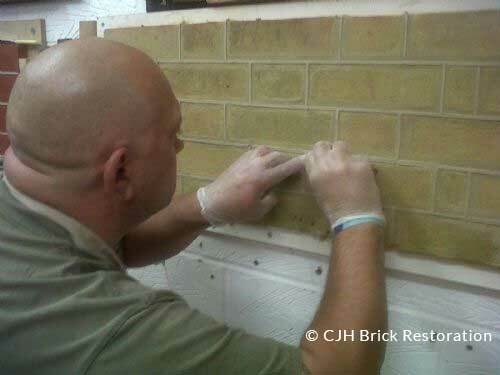 We strive to provide nothing less than excellence to ensure our customers will recommend CJH Brick Restoration to continue to restore and preserve historic buildings in South West London, Middlesex and Surrey. After a long and frustrating time trying to find a local craftsman to tuck point my Victorian semi in lime mortar I found CJH Brick Restoration. From my first enquiry and throughout the project Chris kept me up to date and returned calls/emails promptly. He listened and understood my concerns and queries, explaining the technicalities ensuring I understood the process. Chris and his team, Jordan and Carl, were focused on the painstaking work, tidy and polite. The result was just as I’d hoped. I have no reservations in recommending the company. We had just bought an Edwardian detached house and it needed repointing as there was over a centuries worth of wear and tear to the Red Rubbers on the front of the house. 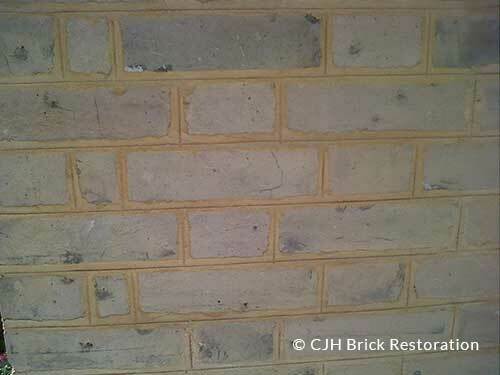 I approached 5 companies and we settled on CJH Brick Restoration after much consideration. We are so happy we did as the finished work is impeccable. Although they were not the cheapest we went with them as we wanted a high quality job – the results speak for themselves. 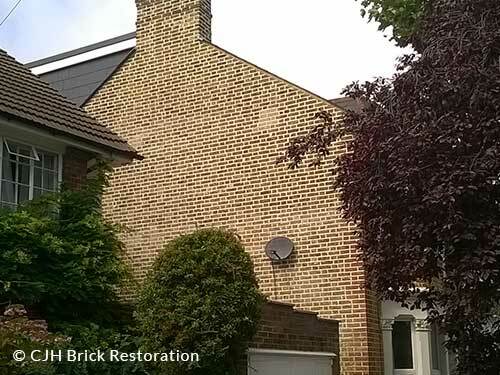 Mr Horne the business owner had a passion and a knowledge of brick restoration and historical construction methods that we could not fault and this was matched by the work he and his team carried out. He has painstakingly restored a tired old building to a work of art and judging by the comments and number of people stopping to look at the finished result we were correct in our decision. Chris and his team were dedicated, polite and tidy. I was kept informed throughout the project of what was happening on a daily and weekly basis. It was a big job, they were on site for 10 weeks and finished on time. We have a turn of the century (c1900) located in Kington upon Thames. Chris is indeed a skilled Master Craftman who could breathe new life to the Tuck Pointing on the brick work of our house. I love the work he as done for me and will be very happy to recommend Chris and this team to anyone looking for this particular special skill. Thank you for a job well done. 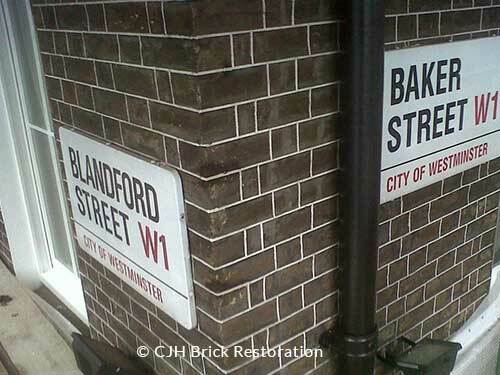 Very happy to recommend CJH Brick Restoration. Chris responded promptly to our initial query and came to inspect our 3m high garden wall which had badly spalled bricks and had previously been repointed with cement mortar. He clearly explained what needed to be done, discussed the options and quoted a very reasonable price, so we gave him the go ahead. 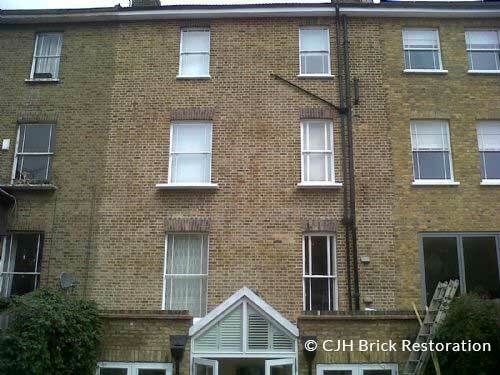 Chris and the team completed the work, which included replacing many bricks and repointing in lime mortar, quickly and to a very high standard. We are delighted with the results. Robert in Thames Ditton.